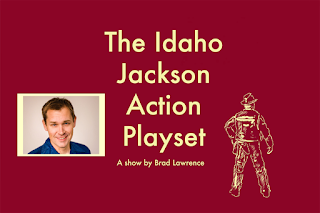 From his first (unexpected) kiss in the second grade lunch line, to the more advanced childhood fears of nuclear war and AIDS in later elementary school, Brad Lawrence has a real rogues gallery of indignities in the life of a young geek to regale us with in The Idaho Jackson Action Playset. And the man barrels through them at near lightning speed. A fellow audience member afterward said to my Mom, “I don’t think I’ve ever seen one person talk so much so fast in one hour in my life.” And it wasn’t meant as a criticism. Even though Lawrence does take the occasional sip of water here and there along the way, he doesn’t seem to take a lot of time to breathe. He’s got a lot of the Reagan era 1980s to get through in a very short amount of time. He doesn’t seem rushed so much as determined. The words come flying out of him and it’s one heck of a ride for those of us listening. As the self-proclaimed youngest and weirdest of eight children, Brad got the hand-me-down clothes, and embarrassing lunchboxes, that just made the unforgiving social politics of grade school that much worse. But everyone does reach their breaking point eventually - and a metal lunchbox can make for a handy weapon. Whether its his brief time as second grade boyfriend, an ill-fated trip to the monkey cages where a chimp was ready with a handful of feces, or the details of an incredibly awkward solo pool party, the social stresses are nothing compared to the scale of the dangers in the world at large. The sudden obsession with secret suburban Satanic cults gives way to thoughts of nuclear war and, later, AIDS. I remember being scared of death as a kid. The end of life. The end of my family. The end of my very small world. Finding your place in a very big world more than ready to dwarf your meager resources with overwhelming odds and dangers, that’s a lot for a young brain to take in. Heck, it’s hard even now to wrap your brain around it all. Brad Lawrence brings it all back - what that feels like - and some small measure of comfort - that of a mother offering peace of mind to her child. Even if that peace of mind eluded her in her own life. Brad Lawrence isn’t just telling awkward funny stories. In the end, they all add up to a pretty powerful place you didn’t realize you were going when you first started following him into the past. 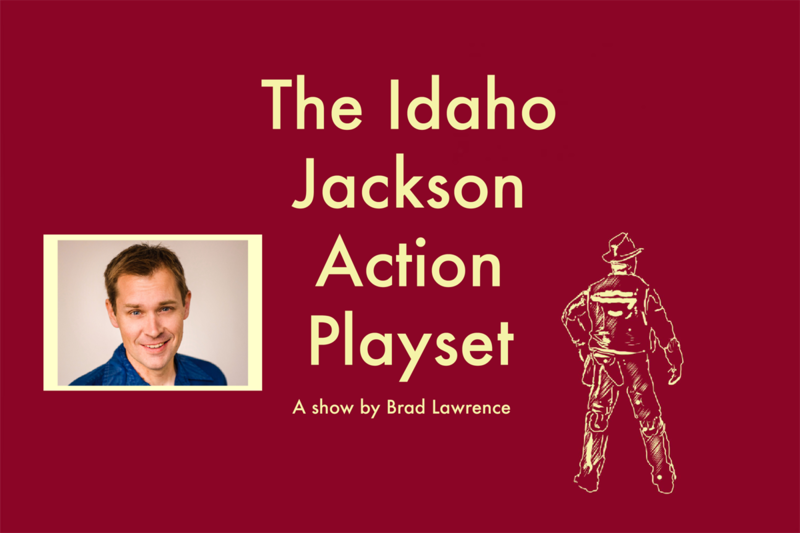 He may have been The Idaho Jackson Action Playset version of a kid, but he’s the genuine article as a grown-up storyteller.